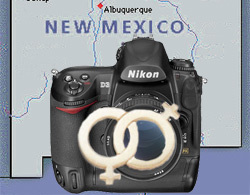 Alleged no more, according to the Las Cruces Sun-News, (NM commission rules photographer discriminated against gay couple, 4/11/08) Albuquerque photographer Elaine Huguenin violated New Mexico's discrimination law, according to a human rights panel. $6,637, which covers Vanessa Willock's costs and attorney's fees. But it's not quite over yet. The Alliance Defense Fund is planning to appeal, and has 90 days to do so. The ADF is a Christian-based religious organization that defends religious liberties where they feel there is an infringement upon religious freedoms by government. Related :2/28/08 - Rights: Yours, Mine, and Theirs. If I consent to being photographed while at an event, or for a portrait for a magazine, the photographer can do certain things with that photo, and cannot do other things. What they can do, is license that image, as stock, for editorial purposes only, provided that that editorial use is not libelous. What they cannot do, is license that image containing my likeness for commercial/corporate uses, without my expressed written consent to do so, usually codified in the form of a model release. Yet, so many photographer I know sell something they do not own, and they could well get sued to within an inch of their lives if they're not careful. If you convey to a client "all rights", inherent in that rights package, under the definition of "all" is, in fact, the right to use that image for advertising and marketing, for corporate and/or commercial clients. Think I'm kidding? Think again. You do not own the right to exploit someone's likeness for commercial gain without their permission - period. In fact, the legality of even placing images of a subject online - released or not - for the purposes of stock licensing of that image - even for editorial purposes - may be deemed commercial exploitation, and subject to restriction. Carolyn Wright over at Photo Attorney writes about the estate of James Brown, who "...filed suit against Corbis in Illinois claiming that Corbis violated Brown's right of publicity for "commercial use of his image on the Internet" by selling/licensing photos of him." (Legislature May Resolve Issue in James Brown v. Corbis Action - 3/31/08). When you transfer "all rights" to a client, the least you must do is say "...all rights are conveyed for which no model releases are required, and photographer hereby stipulates that he has not secured model releases from any subjects." While I certainly suggest that clients who are asking for "all rights" don't need "informational kiosk displays in Minsk", that's what you're giving them, and you should work hard to define a clients rights packages by geography "United States Only", by language "English Only", by duration "for a period of 10 years", and by liability, as noted above. "if I license to my client 'all rights' and then my client uses the photos I gave them for advertising, even though I didn't get a model release, since I licensed to my client 'all rights', do I have any liability?" When they say 'yes', then you'll know. If they say 'no', then ask them to put that in writing, and ask them if they will, in the event you are sued, be willing to defend you, pro bono, if that advice is found to be faulty. They will then do some more research, and likely come back with the 'yes, you're probably either completely, mostly, or somewhat liable...", and then you'll have your honest answer. disclaimer: I am not an attorney. Talk to one about all your legal advice! 50/50, 70/30, 25/75, 80/20, 0 - What's in a number? I'm sitting onboard a United Airlines flight from Savannah back to DC after an assignment down South. I was catching up on my BusinessWeek reading, and ran across a series of advertisements from Accenture. These are great ads featuring Tiger Woods. Interestingly, each ad runs double-truck, full bleed, with a single message point - one message point per entire issue. Since I read several during the flight, I've got five to share/discuss/dissect for your consideration. The message points apply equally to photographers in business as well as those that the ad is targeting. 50% seeing things simply, 50% seeing things fully I.e. Combine razor sharp focus with a through command of the details. How does this apply to you? It is akin to being driven to be (or remain) a photographer, but realizing, for example, that you need to be skilled in things like image management systems, resources for the various toners and inks and why UDMA is the next step in throughput. 70% plan, 30% backup plan. Distinguish yourself not only through the astuteness of your strategy but also by your readiness to nimbly change course should circumstances dictate. Today, on our assignment, we had a plan, and a backup plan, and then a backup to the backup. One other way to put it - from a military perspective, is "no plan survives first contact with the enemy." Knowing, for example, what you will do if your equipment misses the flight, or minimizing flights that are connecting and chosing non-stop flights will decrease the chance that the gear will miss the connection when there is a flight delay. And lastly, where can you rent your lighting once in your destination location if the gear still is missing come shoot day. Further, I almost NEVER book the last flight anywhere. I always have the ability to catch the next flight if something goes wrong with my current flight. This happened last week on a flight from Oakland to Los Angeles for an assignment, and I needed to engage my backup plan. Thankfully, my assistants, whom I had left in Las Vegas, has the same separate experience, and knew enough to do the same thing enroute LA. 25% risk, reward 75%. Continually recalibrate the balance of opportunity and threat for your enterprise. Do you take the more frequent lower paying jobs, or do you "hold out a little" for the bigger fish? What risk level are you comfortable with? 80% improving yourself, 20% proving yourself. High performers aren't defined by what they do to reach the top but what they do to stay there. This is akin to the notion of reinventing yourself, don't rest on your laurels, don't get complacent, and so forth. This suggests continuing your education and learn - be coached, seek those smarter than you. 0% distractions. Peripheral issues may divert the attention of some competitors, high performers maintain unrelenting focus on their highest priority goals no matter how tumultuous the business landscape. Check their research- http://www.accenture.com/research. I can say that I have seen more than my fair share of distractions, and it's a challenge to avert my eyes and focus on what's most important. These are well tested messaging points, and Accenture certainly should be commended for their efforts. What you should take away from these is a rededicated effort to focus on business - all aspects of it. One recurring conversation that I hear taking place is about photographers and second jobs - you know, the ones that make it possible to pay the bills. The problem is, this is bass-ackwards from how it should occur. Take, for example, the waiter. A waiter has figured a way out to pay their bills (even if just barely) from month to month. 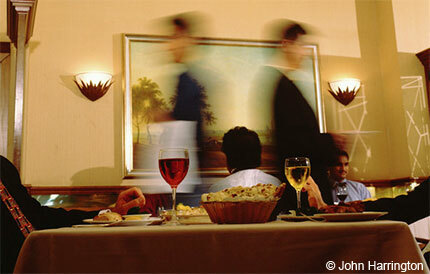 A waiter in this position has a great opportunity to start a business in the field of photography out right. How so? Someone in this position can do an honest assessment of what it costs to be in business, and also what it costs to earn a living doing photography. Say, for example, as a waiter you earn $150/day with wages and tips. An honest assesment of your cost of doing business (CODB) as a photographer might reveal that it would cost you $350 a day for every day you're shooting. So, even though a call comes in for $200 a day - more than your waiter income, but less than your CODB were you a photographer, you can - and should - decline the assignment. Well, being a waiter, your CODB is just a pen, paper and a decent outfit. In fact, you may even have a uniform, but nothing more. Your CODB as a photographer would include costs for computers, internet, cameras/gear, business insurance, and so forth. The declination of the $200 assignment leaves you free to do business in paradigm which keeps you profitable, and moreover, leaves you free to seek out the proper paying clients that you not only can do your first assignment for, but also grow a solid relationship with - enough so that you can afford to leave your waiter job. IF you have taken a second job to sustain your CODB as a photographer, then you're likely going to fail. It's really not a matter of if, it's most likely a matter of when. In other words, your second job should be that of photographer!